Many of you have already used the newly-released Discovery/EDS Health search tool made available last week. With the multitude of resources available from this service, there are also a number of options to perform a search. The types of searches available will depend on how you access it. The default is to search all resources by keyword, and that will provide the broadest results from all of the databases, books, and journals available through the Discovery service. One drawback, though, is that the keyword searching is extremely broad; it will pick up that term or phrase in any titles, abstracts, or other descriptions for each work. If you select one of those other options, you will still be looking at all of the resources in the Discovery service, but your search will be limited to those fields for the term you entered. You can further limit your search by choosing one of the other available tabs in the search box if you would like to just search for articles or available books. The Journals tab performs a search of the E-Journals & E-Books A to Z List, so it takes you out of the Discovery tool at this time. This is the basic search screen for the service, but it functions much like the search box above. The default is a keyword search of all resources. For those who use other EBSCOhost databases such as CINAHL Complete or Academic Search Complete, searching from this screen should be familiar and it functions much like the other databases. You can also choose to perform an Advanced Search from this screen to craft a multi-faceted complex search string. Stay tuned for more tips on how to use the new Discovery tool, but if you have any questions, please contact us. New Coffee Vending Machine in Library Commons! A new coffee vending machine has been installed in the Isché Library Commons! When the need to refuel while studying strikes, just go to the 3rd floor Library Commons for a cup of coffee, tea, or hot chocolate. Don’t forget that the Commons are open 24/7! Coffee is $.75, and everything else is $1.00 (tea, hot chocolate, latte, etc.). The machines take cash only (no PayPaw). Tags: Quick Tip | Campus News, Faculty News, Library Commons, Library News, Student News, Tips | Permalink | Comments Off on New Coffee Vending Machine in Library Commons! | Posted Friday, January 27, 2017 by Corder, Amy L.
If you’re new to campus or have a new iPad, here are a few tips to help you get connected to the LSUHSC networks. For those who would like to set up Citrix on their iPad, we have put together a walkthrough to help you with this process. If you would like to set up your LSUHSC e-mail for use through the Mail app, more information can be found on this page. However, if you would like to receive your LSUHSC mail on your iPad, you will have to set up a passcode lock for your device if you have not already done so. If you need any help with these steps or require anything else from the Library, please do not hesitate to contact us. If you need any assistance with these steps or anything else from the Library, please do not hesitate to contact us. For those using the BrowZine app to browse the Library’s online journals, we are happy to now offer the ability to export references to RefWorks. You can access this feature when you’ve retrieved the full text of an article. 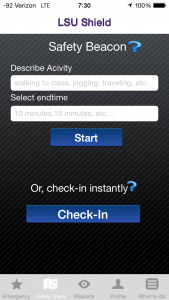 In either version of the app, you’ll then be asked to login with your RefWorks i.d. and password and the citation will be added to your account. All of the usual citation elements are automatically filled in, but you will also see information in the “Notes” and “Data Source” fields indicating that it came from BrowZine. If you need more information about how to access BrowZine check out our LibGuide. 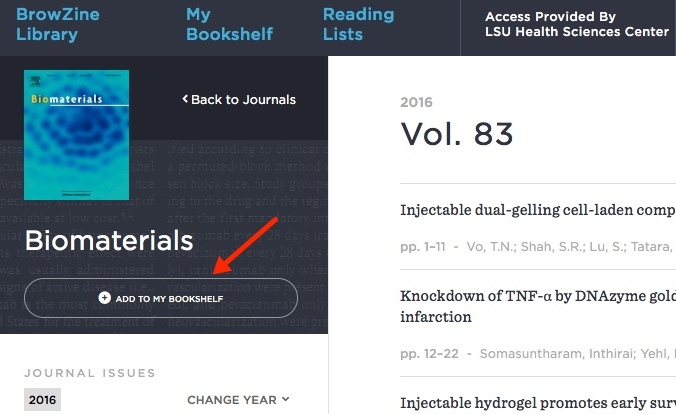 You can use BrowZine to keep up with your favorite journals and subjects, but it also provides a great way to easily access your favorite publications. 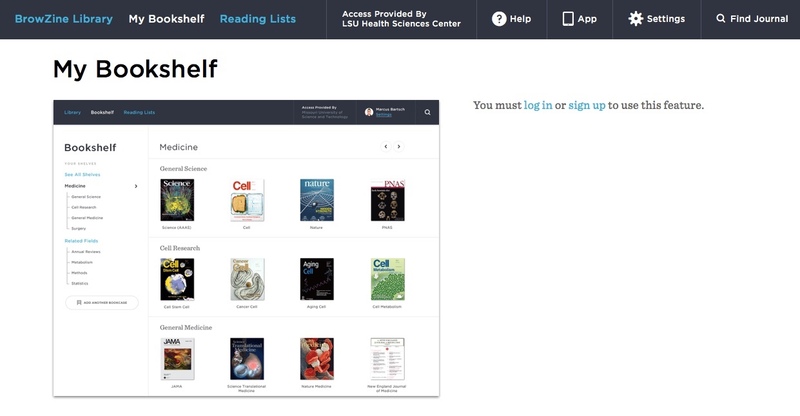 The web version of BrowZine lets you create, customize, and organize your personal bookshelf. 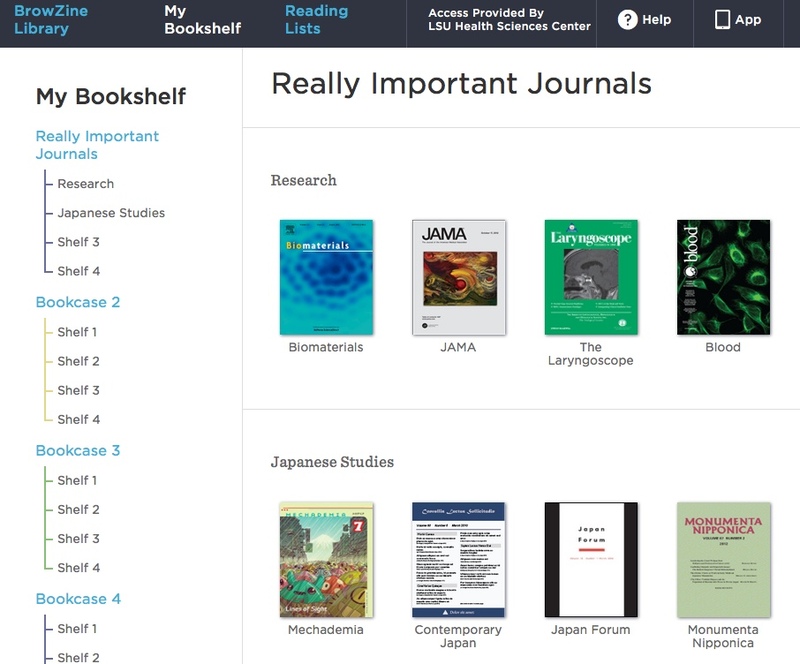 You Bookshelf will now display that journal as well as any others you choose. Each Bookshelf has four Bookcases with four shelves each. You can have a maximum of four titles per shelf in each Bookcase, so your Bookshelf can ultimately house 64 of your favorite journals. You can also move titles to any shelf or Bookcase to arrange them as you wish. An upcoming enhancement will provide the ability to sync your BrowZine web Bookshelf with the one in the app on your mobile device. The folks behind BrowZine, Third Iron, have a page that provides information about the web Bookshelf and new features on their site. If you need more information about BrowZine or any other Library services, please do not hesitate to contact us. Help is on the way! This free app allows you to contact emergency services with one button, submit non-emergency reports with a photo and/or video and submit reports anonymously. 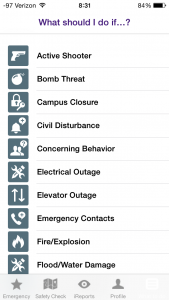 Upon completing registration, users will have access to the Emergency Call feature which is routed to the LSUHSC University Police while on campus. The EMS button directly calls Orleans Parish EMS. 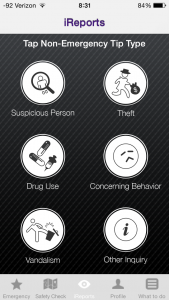 This app is one of many new ways the LSUHSC University Police is making it easier to contact them for help. It is available for download through the App Store or Google Play. For more information, please visit http://911.lsuhsc.edu/report/lsushield.aspx. 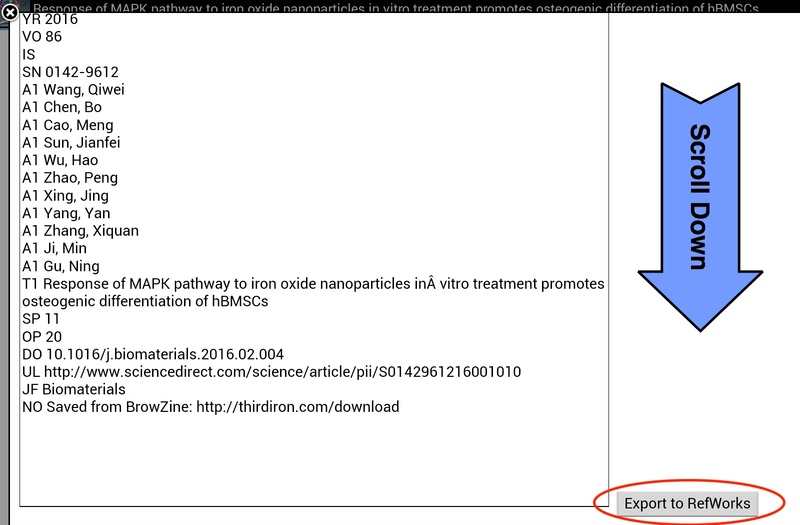 Within the article summary display, two changes have been made. 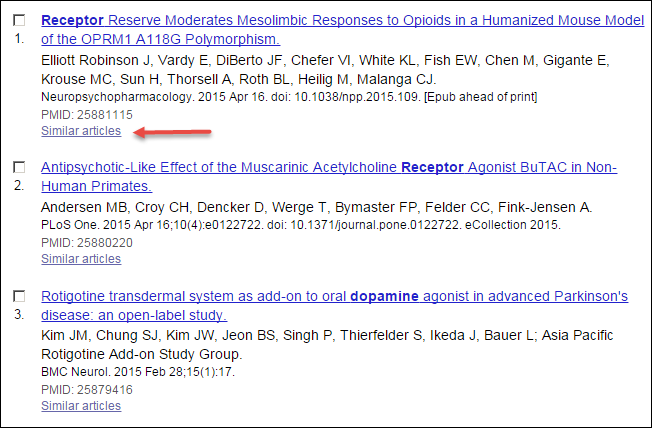 The term “Related Citations” has been changed to “Similar Articles”. It was thought that “Related Citations” was ambiguous., The algorithm to generate the results of a search on for similar articles has not changed, just the name of the feature. Also, the status tag line has been removed from the article summary display. Most users will not notice this change but experienced searchers may. The status tag line is still included in the Abstract display. 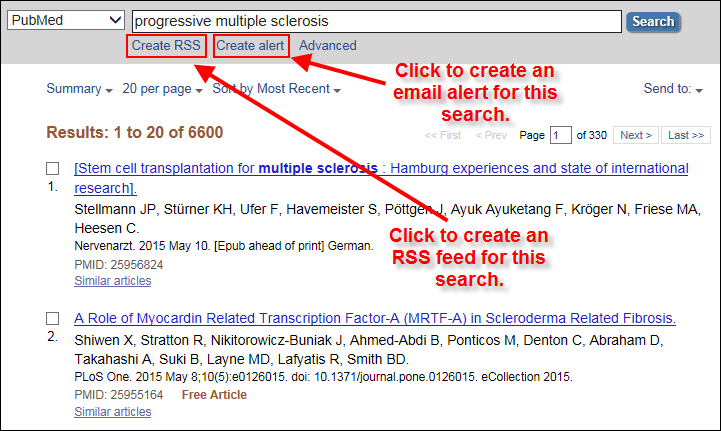 The “Save Search” link for creating My NCBI email alerts has been renamed “Create alert” and the “RSS” link has been renamed “Create RSS”. Once again, these changes will not affect the functionality of PubMed they are only intended to eliminate ambiguity and to make the process smoother. 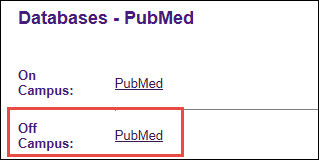 Finally, for those who use PubMed Mobile, there have been updates with a number of styling modifications and additional enhancements including a “Trending articles” feature. For more information about these changes, you can refer to the New and Noteworthy link on the bottom of the PubMed screen or refer to the NLM Technical Bulletin.